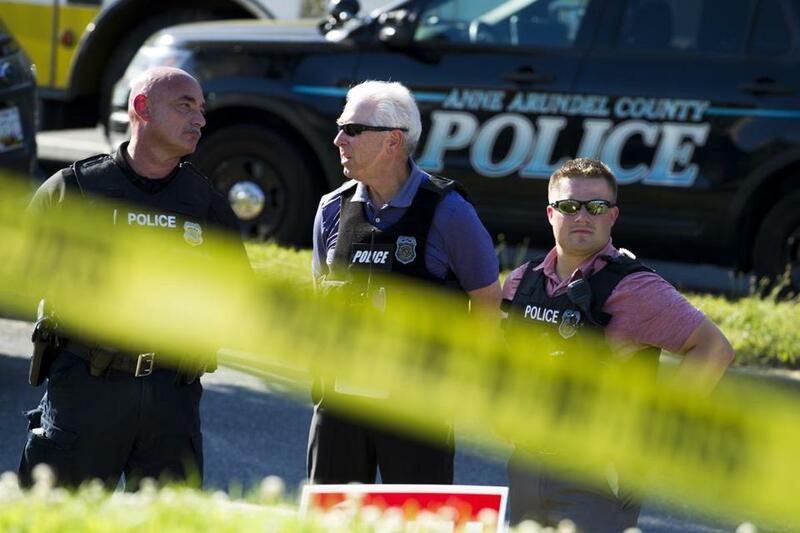 Police officers secured the area after multiple people were shot at an office building housing The Capital Gazette newspaper in Annapolis, Md., Thursday. ANNAPOLIS, Md. 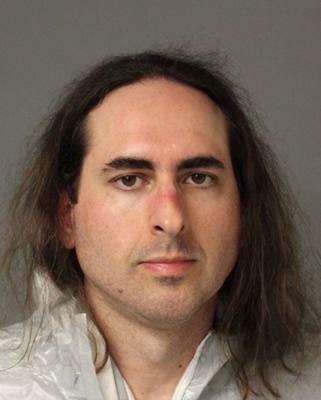 (AP) — The man accused of killing five people at a Maryland newspaper was investigated five years ago for a barrage of menacing tweets against the daily, but a detective concluded he was no threat, and the paper didn’t want to press charges for fear of inflaming the situation, according to a police report released Friday. The 2013 police report added to the picture emerging of 38-year-old Jarrod W. Ramos as the former information-technology employee with a longtime grudge against The Capital of Annapolis was charged with five counts of first-degree murder in one of the deadliest attacks on journalists in U.S. history. Authorities said that Ramos barricaded the rear exit of the office to prevent anyone from escaping and methodically blasted his way through the newsroom Thursday afternoon with a 12-gauge pump-action shotgun, cutting down one victim trying to slip out the back. Three editors, a reporter and a sales assistant were killed. The employees killed were Gerald Fischman, Rob Hiaasen, John McNamara, Rebecca Smith and Wendi Winters, police said. ‘‘The fellow was there to kill as many people as he could,’’ Anne Arundel County Police Chief Timothy Altomare said. Ramos, a clean-shaven figure with long hair past his shoulders, was denied bail after a brief morning court appearance in which he took part by video, watching attentively but saying nothing. Authorities said he was ‘‘uncooperative’’ with interrogators. He was placed on a suicide watch in jail. His public defenders had no comment outside court. The first-degree murder charges carry a maximum penalty of life without parole. Maryland has no death penalty. The bloodshed initially stirred fears that the recent surge of political attacks on the ‘‘fake news media’’ had exploded into violence. But by all accounts, Ramos had a specific, longstanding grievance against the paper. Ramos had filed a defamation suit against the paper in 2012 after it ran an article about him pleading guilty to harassing a woman. The lawsuit was later thrown out by a judge as groundless. And Ramos had repeatedly targeted staff members with angry, profanity-laced tweets. ‘‘There’s clearly a history there,’’ the police chief said. Altomare disclosed Friday that a detective investigated those concerns that year, holding a conference call with an attorney for the publishing company, a former correspondent and the paper’s publisher. The online grudge apparently ‘‘went dark’’ for a period until some new posts just before the killings, Altomare said. The chief said police were not aware of Ramos’ recent online activity until after the rampage. Few details were released at the court hearing on Ramos, other than that he is single, has no children and lives in an apartment in Laurel, Maryland. He was employed by an IT contractor for the U.S. Labor Department’s Bureau of Labor Statistics from 2007 to 2014, a department spokesman said. The rampage began with a shotgun blast that shattered the glass entrance to the open newsroom. Ramos carefully planned the attack, using ‘‘a tactical approach in hunting down and shooting the innocent people,’’ prosecutor Wes Adams said. Adams said the gunman had an escape plan, too, but would not elaborate. Journalists crawled under desks and sought other hiding places, describing agonizing minutes of terror as they heard the gunman’s footsteps and the repeated blasts of the weapon. ‘‘I was curled up, trying not to breathe, trying not to make a sound, and he shot people all around me,’’ photographer Paul Gillespie, who dove beneath a desk, told The Baltimore Sun, owner of the Annapolis paper. Gillespie said he heard a colleague scream, ‘‘No!’’ It was answered by a gunshot blast. He heard another co-worker’s voice, then another shot. 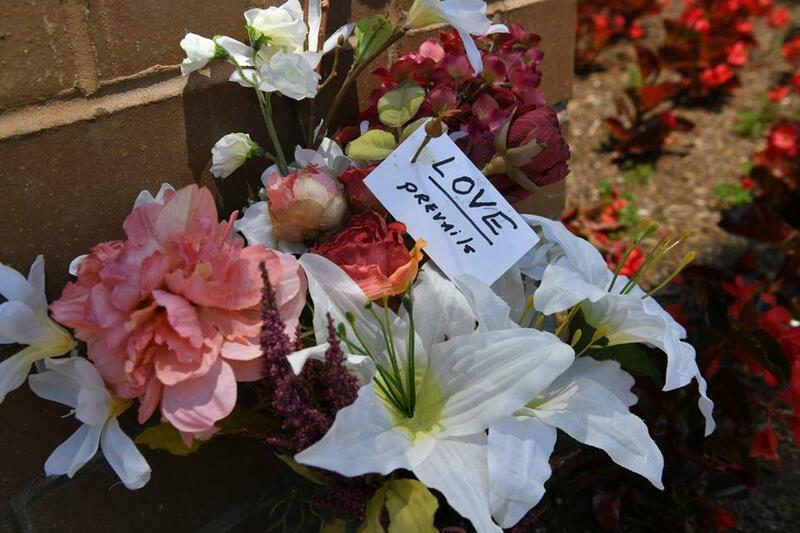 Flowers, US flags, and messages adorned a makeshift memorial for 5 journalist killed at the Capital Gazette newspaper. Some 300 local, state and federal officers converged on the scene and within two minutes police had begun to corner Ramos, a rapid response that ‘‘without question’’ saved lives, Altomare said. Ramos was hiding under a desk and did not exchange fire with police. Ramos was identified with the help of facial recognition technology because of what the chief said was some kind of ‘‘lag’’ in getting results from the computer system used to analyze fingerprints. Police denied news reports that Ramos had mutilated his fingertips to thwart his identification. Two officials told The Associated Press on Thursday night, based on preliminary information, that the gunman may have deliberately damaged his fingers. The chief said Ramos’ shotgun was legally purchased about a year ago despite his guilty plea in the harassment case. He also carried smoke grenades, authorities said. Investigators are reviewing Ramos’ social media postings and searched his apartment, where Altomare said they found evidence of the planning Ramos had put into the attack. The chief would not give details. Those killed included Rob Hiaasen, 59, the paper’s assistant managing editor and brother of novelist Carl Hiaasen. Also slain were editorial page editor Gerald Fischman, special projects editor Wendi Winters, reporter John McNamara and sales assistant Rebecca Smith. The city of Annapolis announced a vigil for the victims Friday night at a public square near the State House. Associated Press writers Eric Tucker in Washington; Michael Balsamo in Los Angeles; Michael Kunzelman in Annapolis; and Sarah Rankin and Denise Lavoie in Richmond, Va., contributed to this story, as did the AP News Research Center in New York.